I have a new article out at Slate arguing that even though many energy companies and government agencies like to use simple “energy intensity” to measure the energy efficiency of the economy, it’s a misleading metric that, among other things, fails to recognize the embedded energy (and carbon emissions) in goods imported from other countries. The international focus on “energy intensity” is hurting the fight against climate change. It is widely assumed that over the coming decades, increased energy efficiency will help the world meet its energy needs and reduce carbon emissions. That may be true, but recent research suggests that energy intensity—a widely used way of measuring efficiency—isn’t the right metric. Energy intensity is a simple ratio: energy use per dollar of GDP. According to the U.S. Energy Information Administration, the energy intensity of the U.S. economy declined by 1.6 percent per year from 1985 to 2004, suggesting that we’re doing more with less energy. That sounds pretty good, and to a certain extent it’s true. Numerous changes in the U.S. economy have gradually made it more energy efficient since the 1970s, and it is widely observed that the world’s most developed economies are more energy efficient than developing economies. However, it’s far from certain that developing economies will achieve enough wealth to attain First World levels of energy efficiency, as agencies like the Intergovernmental Panel on Climate Change assert, or that the historical trend of improving energy efficiency will persist into the future, as many other observers, like Credit Suisse, assume. If these assumptions don’t pan out, we could encounter a climate and energy supply catastrophe much sooner than imagined in official scenarios. First, the very structure of the energy intensity ratio is problematic. As the U.S. Energy Information Administration notes, it “overstates the extent to which energy efficiency improvements have occurred in the economy. …” For one thing, when the economy is growing faster than energy consumption—when the GDP denominator is growing faster than the energy numerator—energy intensity falls. But in a recession, GDP tends to fall faster than energy consumption, and so the energy intensity ratio rises. This would be true even if there were no change in energy efficiency. Indeed, the Paris-based International Energy Agency notes in its World Energy Outlook 2012 that in 2009 and 2010, global energy intensity actually increased due to economic contraction, lower energy prices (which boosted energy consumption), and colder or hotter weather in certain regions. “The production of a huge number of goods, the mixing of the transport of freight and people, and the variety of housing and climates makes an aggregate energy intensity number based on Gross Domestic Product (GDP), a number that disguises rather than illuminates,” the Energy Information Administration says. Energy intensity is also affected by population size, travel patterns, natural resource endowments, changing activity within the economy like shifting from steel production to electronics, technological improvements like using robots, and off-shoring of energy-intensive industries like manufacturing to other parts of the globe. For the past several decades, the United States and Europe have obtained increasing amounts of their manufactured goods from Asia as they transitioned to service-oriented economies, hiding some of the actual energy they consume. This has led to accusations that industrialized countries have “cheated” on their decarbonization claims by substituting imports for domestic production in energy intensive industries. There may be something to those claims. Disentangling the embedded energy of imports from broader economic data is notoriously difficult, but Tao Wang, a postdoctoral economist from Princeton at the Environmental Defense Fund, has attempted to quantify the effect of international trade on the carbon emissions of the industrial sector only. After discounting technological improvements, overall growth in the size of the economy, and other factors, Wang finds 20 percent of the reduction in U.S. industrial CO2 emissions since 1998 came from trade (i.e., outsourcing). Carbon emissions are not a direct measure of energy consumption (although they are closely related), nor are industrial emissions a direct proxy for the broader economy. But there is a much larger body of research on the trajectory of carbon emissions than there is on energy intensity, and some of it suggests that the trade effect is much larger on an economy-wide basis. For example, the amount of China’s greenhouse gas emissions that resulted from exports were estimated at 23 percent for 2004 by researchers at the at the Tyndall Center for Climate Change Research in England, and at 33 percent for 2005 by researchers at Carnegie Mellon University in Pittsburgh. Recognizing the flaws of simple energy intensity ratios, the U.S. Energy Information Administration has developed several new indexes to measure the real energy efficiency of the economy. One of them, the “economy-wide energy intensity index,” attempts to measure the energy needed to perform a particular activity, but measures it in energy terms to avoid the pitfalls of GDP. (As Robert F. Kennedy quipped in 1968, GDP “measures everything … except that which makes life worthwhile.”) By the Energy Information Administration’s index, the aggregate intensity of transportation, industrial activity, residential and commercial buildings, and electricity generation across the whole U.S. economy fell by only 0.56 per year—one-third the rate of the simple measure. Second, the rate of decline in energy intensity has slowed considerably in recent years, from 1.2 percent per year on average between 1980 and 2000, to only 0.5 percent per year between 2000 and 2010, according to the International Energy Agency. The agency attributes most of the slowdown to the global shift of energy-intensive activity to the developing countries of Asia, where coal is still king in power generation. In its World Energy Outlook reports, the International Energy Agency has repeatedly urged the world to adopt policies that accelerate improvements in energy efficiency. In its 2012 report, it graphically illustrated what energy demand would look like under multiple scenarios and what it would take to limit global atmospheric carbon concentrations to 450 parts per million—the concentration generally agreed to limit the average global temperature rise to 2 degrees Celsius over pre-industrial levels and avoid the worst outcomes of global warming. The International Energy Agency’s New Policies Scenario assumes a 16 percent reduction in energy intensity by 2015 in China, new fuel-economy standards in the United States, a 20 percent reduction in Europe’s energy demand by 2020, and a 10 percent reduction in Japanese electricity demand by 2030. But the International Energy Agency admits that even with the 1.8 percent per year reduction in global energy intensity through 2035 outlined in its optimistic New Policies Scenario, the world would hit the international 2-degree target by 2017. To delay that intersection by just five years, the reduction in global energy intensity would need to be 2.4 percent per year—a rate that has never been attained—and achieved through an additional $11.8 trillion investment in efficient end-use technologies. Unfortunately, even the International Energy Agency’s New Policies Scenario might be out of reach. For example, it is far from certain (or even likely) that China will develop its substantial shale gas resources and drastically cut its coal demand after 2015. According to a 2008 analysis by researchers at the Universities of California at Berkeley and San Diego, the IPCC estimate of China’s CO2 emissions rising by 2.5 to 5 percent between 2004 and 2010 was far too low; the region’s emissions were actually set to grow by at least 11 percent. According to the U.S. Energy Information Administration, China’s coal consumption has surged for 12 consecutive years, and it now burns almost as much coal as the rest of the world combined. Things aren’t much better in the United States, which has been expected to help lead the way on global energy efficiency improvement. A congressional package of tax credits and grants designed to cut the power demand of buildings and factories faces an uphill climb against intransigent GOP lawmakers determined to block any increase in federal spending. Meanwhile, hopes for a binding global agreement to take action on climate change are all but dead, while carbon emissions and energy consumption are projected to keep rising up, up and away in all status-quo scenarios. But perhaps a kind of progress is under way. President Obama’s 2008 “Plan to Make America a Global Energy Leader” declared his intent to “[d]ramatically improve energy efficiency to reduce energy intensity of our economy by 50 percent by 2030.” By contrast, the just-released 2013 Economic Report of the President recognizes the deficiencies of simple energy intensity, highlights the Energy Information Administration’s new Economy-Wide Energy Intensity Index as a better way of measuring energy efficiency, and expresses a commitment to achieve better energy efficiency and switch to zero-emissions energy sources like wind and solar. The European Environment Agency, however, still uses the energy intensity metric and claims that it shows a “decoupling between energy consumption and economic growth” which “is likely to alleviate the environmental pressures of energy production and consumption.” Such blithe assertions cannot be the basis for sound climate and energy policy. 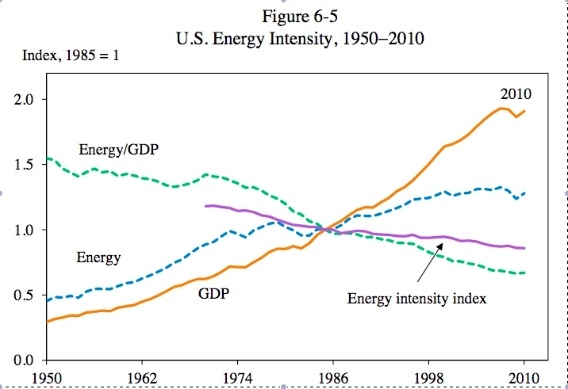 It’s time to leave the squishy energy intensity metric in the dust. As Wang remarked, “Lower energy intensity is not the only way to solve the climate change problem.” Real improvements on climate and energy can’t be obtained by offshoring dirty industries to the rest of the world. Only an economy that runs efficiently on clean energy will suffice.